After the welcome remarks (by moi), intention setting, and pre-creek delicious bites by Chef Brandon Grimila up at Promise Ridge, guests got to choose between a carpool caravan down to the secret creek spot or the option of joining Naturalist Aliza Kawecki on a 20-minute edible foraging walk. The forgers gathered mustard, nettle, wild ginger, concord grapes, edible greens, and other medicinal plants that the chefs would later incorporate into our meal. Once at the creek, we descended a specially made staircase down into the water (thank you Will Croasdale! ), where a positively enchanting scene awaited us. Down creek from the long communal table set for 60, Chef Andre deWaal had docked a metal rowboat, repurposed to serve as his kitchen for the day, so that he and Chef Mike Carrino could prepare and serve from a cooking fire built right there in the water. 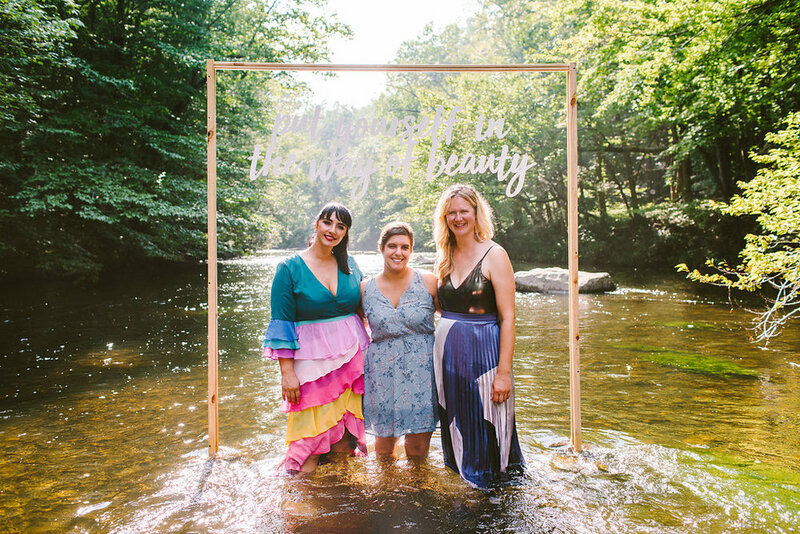 Three large origami boats, created and installed by Nathan Kanofsky and Heather Arak-Kanofsky, floated in the water near the banks of the creek, adding to the magically whimsical atmosphere. 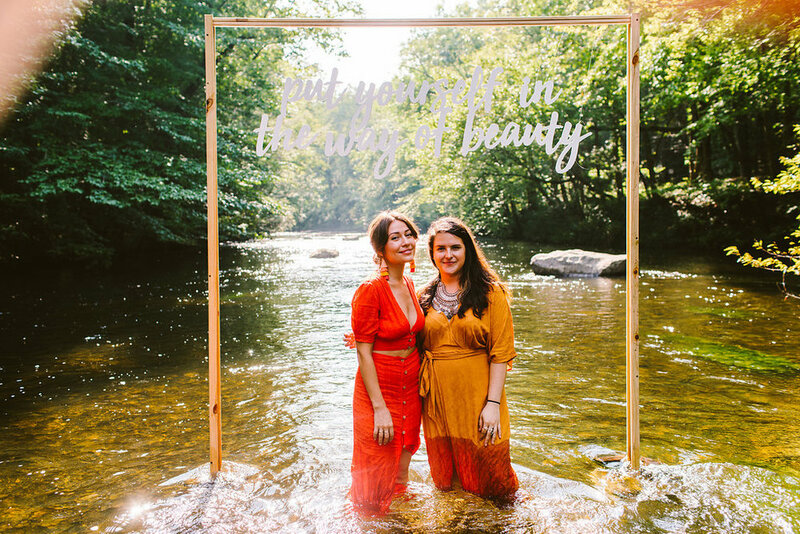 And suspended over the water in a Temple-like Threshold were the words, “Put yourself in the way of beauty,” expertly laser cut by Lexi Eveleth, owner of Ever Laser. Of course, the ultimate most central collaboration for this gathering remains the table. 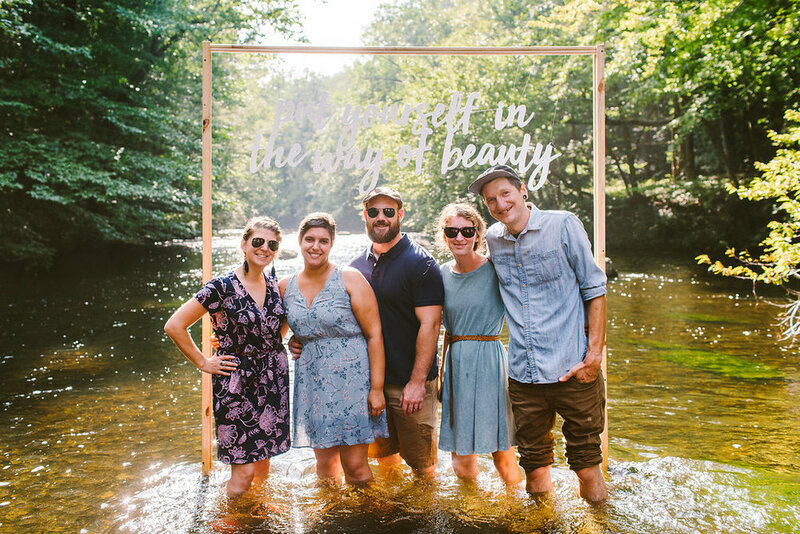 We are incredibly fortunate to have Renee and Derek Bower (along with the whole Forget Me Not Vintage Rentals crew) on board for all of our wild secret spot location ideas. The table itself was lovingly set by Nicole Hutnyk of Rabbit, Rabbit Crew!, splendidly laid with white grid dishware, so as to allow the colors of our food to pop, while preserving the flower arrangements as the focal points. The menu, like last year, was printed on cloth napkins by Gifts for the Good Life, with appetizing menu details hand-lettered by Sarah Pawlowski of Flourish Grace. Adorable mini origami boats were clipped on to decorate the rim of Nicole’s signature Kismet glasses. 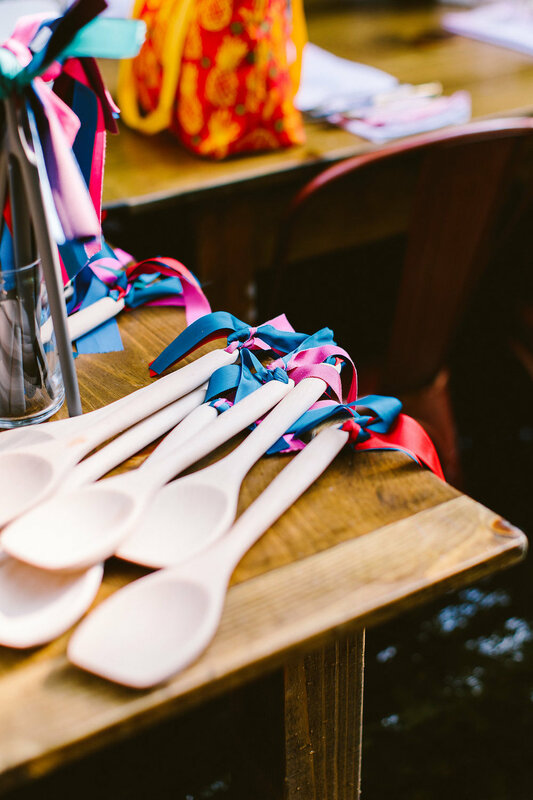 Besides hauling all the farm tables and 60 chairs into and out of the creek, Forget Me Not Vintage Rentals also loaned us their mix-matched gold flatware...and in doing so, became the metaphorical “pot of gold” at the end of the rainbow! Beauty and thoughtfulness abounded, once we had crossed into the bubbling waters of the creek. Sarah Petryk of Allium Floral Design & Event Styling had been thinking quite a bit on what her contribution was going to be for our third gathering. When our design theme of the rainbow was announced, those creative pieces she was imagining came into crisp focus: along with her team, Donna and Emma, she created a jaw-dropping rainbow of ribbons elevated over the length of the communal table — an almost literal crown of jewel tones. This rainbow of ribbons also played a role in helping guests find their color-coordinated seat at the table when it was time for dinner. Sarah worked with all-local flower growers, PW Planting and Flores Temporis, to line the table with flower arrangements in every shade, carefully matched to the ribbons above. This year, guests were in for a surprise flashmob-esque performance of everybody’s favorite Kermit the Frog single: “Rainbow Connection!” Lou Rogai started strumming his guitar and singing...and soon enough, Alisa Tongg, Rob and Jill Howell, and Christopher Souza (on the violin as well) joined in for a heart-warming rendition dedicated to “the lovers and the dreamers.” We each got to sing one of our favorite lines from the song, too! My favorite line is “somebody thought of that, and someone believed it…look what it’s done so far.” When I sang this line, standing in the water and looking out at all the faces and the incredible scene before me, it had come to symbolize what our communal dinners have become. At first, it was just an idea, a creative spark. But others believed in it, and today we nurture a dedicated community of loved ones and collaborators. After our song, all 60 guests clasped hands for our twist on the Quaker Grace—where one person starts by squeezing the hand of the person to their right, and that person squeezes the hand on their right, and so forth...the love and warmth travels through everyone present, full circle. As guests dispersed, we were each invited to find our place at the table based on the color we were wearing, and the color of the ribbon rainbow overhead. It was thrilling and moving to see our group become a rainbow as each of us took our places around the communal table.